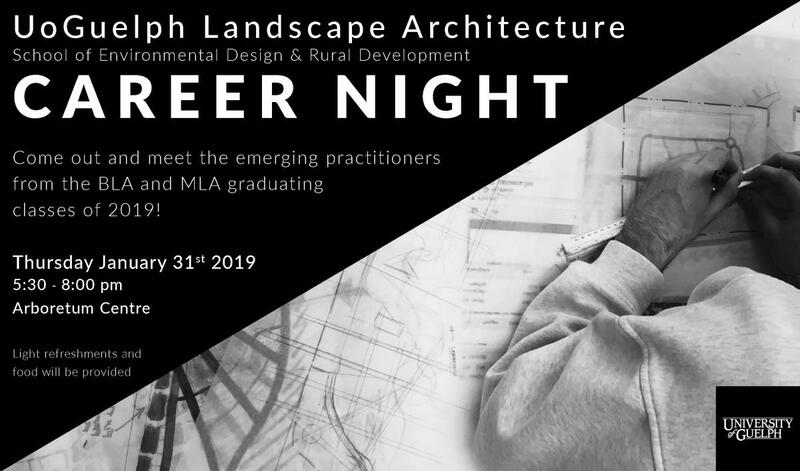 The University of Guelph’s Landscape Architecture programs in the School of Environmental Design and Rural Development invite LA firms and public sector organizations to attend our 2nd annual LA Career Night on January 31st at the Arboretum. Designed to connect our BLA and MLA graduating classes with prospective employers, this networking event offers the profession exposure to emerging practitioners, and students the opportunity to find potential opportunities post-graduation. The night will include opening remarks from guest speakers, a ‘speed dating’ format, and time to mingle and chat with professionals about job opportunities, events in landscape architecture and any another topics of interest. Event kindly supported by gifts from Maglin Site Furniture and Wright Landscape Services.